A colony of bats, a bubbling cauldron, and a bathtub filled with blood. Those are just a few of the macabre images glimpsed in the latest trailer for Chilling Adventures of Sabrina’s upcoming second season. From the looks of things, Sabrina is about to get into a lot more mischief in these new episodes. However, she seems totally fine with that. Now that her mortal friends know about her supernatural heritage, she doesn’t have to worry about hiding her true nature. Of course, it’s also possible that this newfound openness might be going to her head. This Sabrina is clearly not the same one we last saw at the end of last season. Whether she’s setting fire to her high school or entering a steamy new romance with Nicholas Scratch, it’s hard to pin down her intentions. Whatever they are, they seem to have gotten the attention of the Dark Lord Satan himself. One way that Chilling Adventures’ differs from Sabrina the Teenage Witch is that it hasn’t shown the character using conventional magic. That is, she didn’t wave her fingers around to cast spells. Anyone missing this familiar sight might be pleased to learn that she’ll be doing some of that this time around, albeit in a more gruesome way. 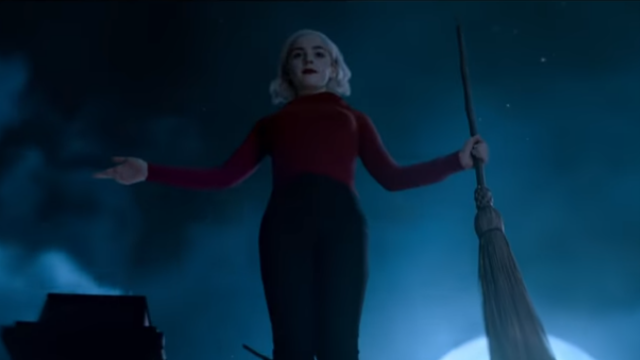 Watching Sabrina use her witchly powers to snap a few necks makes us wonder where her allegiances lie this year. But more than that, it gives us all the enticement we need to get excited for the new episodes. Chilling Adventures of Sabrina season 2 premiers on Netflix on April 5. You can check out the new trailer below, then tell us what you think in the comment section!